Inova T5C-01-R7 T5 672 Lumen LED Tactical Flashlight FREE SHIPPING! 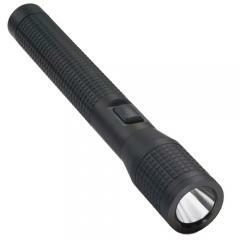 The INOVA T5 is a powerful, handheld LED flashlight designed for professionals. On its high setting, it produces a bright 672 lumen beam with a reach of over 700 feet, and the machined aluminum reflector provides a focused spot with flood beam for versatility. A convenient switch mounted midway along the body switches between high, medium, low, strobe and momentary high modes. It is electronically controlled to provide consistent output throughout the life of the battery. The flashlight is made from Type III anodized aerospace aluminum for effective shock and crush resistance, and its durable mineral glass optical window comes with a Teflon seal for environmental hazard protection. Deeply textured knurling provides a secure, non-slip grip. ©2002-2019 CopsPlus.com: Inova T5C-01-R7 T5 672 Lumen LED Tactical Flashlight FREE SHIPPING!